Up to 3,500 kg (7,700 lb) of weapons including six AAMs &#8212; a mix of SARH and R-60/AA-8 Aphid, R-27/AA-10 Alamo, R-73/AA-11 Archer, FAB 500-M62, FAB-1000, TN-100, ECM Pods, S-24, AS-12, AS-14. MiG-29 "Fulcrum A" (Product 9.12): Initial production version. Entered service in 1983. MiG-29B-12 "Fulcrum A" (Product 9.12A): Downgraded export version for non-Warsaw Pact nations. Lacked a nuclear weapon delivery system, and possessed downgraded radar, ECM and IFF. MiG-29UB-12 "Fulcrum B" (Product 9.51): Twin-seat training model. Lacks radar and GSh-30 cannon. MiG-29S-13 "Fulcrum C" (Product 9.13): MiG-29 variant similar to 9.12, but with an enlarged fuselage spine containing additional fuel and a Gardeniya active jammer. MiG-29S-13 "Fulcrum C" (Product 9.13S): Version with the same airframe as 9.13, but with an increased external weapons load of 4,000 kg, and provision for two underwing fuel tanks. Radar upgraded to N019ME, providing an ability to track 10 targets and engage 2 simultaneously. Compatible with AA-12 'Adder' (R-77) (similar to AIM-120 AMRAAM) missiles. MiG-29SM "Fulcrum C" (Product 9.13M): Similar to 9.13, but with ability to carry guided air-to-surface missiles and TV/laser-guided bombs. MiG-29M/MiG-33 "Fulcrum E" (Product 9.15): Advanced multi-role variant, with a redesigned airframe constructed from a lightweight aluminum-lithium alloy. Mechanical flight controls replaced by an analogue fly-by-wire system. Powered by enhanced thrust RD-33K engines, with 86 kN of thrust (afterburning). Weapons load increased to 4,500 kg, and additional fuel tanks installed within the fuselage to give a total maximum range of 2,000 km (on internal fuel). Original radar replaced by N010 "Zhuk", providing ground mapping capabilities and terrain-following flight modes. New "glass" cockpit displays, consisting of 2 cathode ray tube MFDs. Compatibility with R-77 AAMs and a wide range of guided air-to-ground munitions added. Number of weapon hardpoints increased to 8 (4 under each wing). Originally intended as a replacement for earlier MiG-29 versions, but funding problems have prevented any MiG-29M purchases by the Russian Federation Air Force (VVS). MiG-29UBM (Product 9.61): Twin-seater training variant of MiG-29M. Never built. MiG-29SMT (Product 9.17): Upgrade of first-generation MiG-29s (9.12 to 9.13), containing many enhancements intended for the MiG-29M. Additional fuel tanks in a further enlarged spine provide a maximum flight range of 2,100 km (on internal fuel). Cockpit displays upgraded with 2 large liquid-crystal MFDs in full color and two smaller monochrome LCD displays. Upgraded N019MP radar provides additional air-to-ground modes and increased range. Engines intended for installation are RD-43 turbofans, providing up to 98.1 kN of thrust. Weapons load increased to 4,500 kg, with similar weapon choices as the MiG-29M variant. This version is currently serving the air forces of Russia and Yemen. MiG-29K "Fulcrum D" (Product 9.31): Naval variant, similar to MiG-29M except with equipment such as folding wings, arrestor gear, and reinforced landing gear. Orginally for the Admiral Kuznetsov class aircraft carriers, but cancelled. 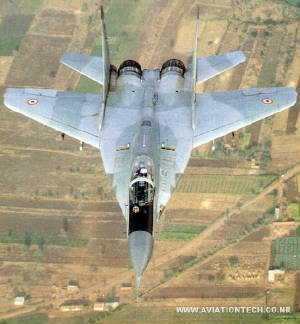 MiG-29K "Fulcrum D" (Product 9.41): Updated ship borne version, intended for the Indian Navy. Based on the original 9.13, but with additional fuel tanks in the fuselage spine and a folding radome. Cockpit displays consist of LCD MFDs, and a new digital fly-by-wire system replaces the original analogue system. Compatible with the full range of weapons carried by the MiG-29M and MiG-29SMT. MiG-29UBT (Product 9.51T): Similar to SMT upgrade, but for the MiG-29UB. MiG-29OVT/MiG-35 "Fulcrum F": Production version of the latest MiG-29 with the proven thrust-vectoring engine that use fly-by-wire technology. The aircraft uses the same airframe of the MiG-29M1. The fighter is more agile and has an increase in range to 2,139 km (1,329 statute miles). With improved avionics, vast improvements in weapon systems, HOTAS systems, wide range of weapons of air to air and air to ground, as well as a variety of defensive and offensive avionics suite. It is no longer tied to the GCI system and would be able to conduct operations independently. It has eight weapon pylons and be able to refuel as well as carry three external fuel tanks. The aircraft is being marketed under the designation MiG-35 for potential export. Russia is promoting the aircraft to various countries in the Middle East (namely Syria and Iran), in Africa (Algeria and Sudan), Latin America (Brazil and Peru), and India, to name a few. Malaysia is evaluating the type to add to its existing MiG-29B-12 Fulcrums and to the new Su-30MKM 'Flankers', to be delivered in 2006.